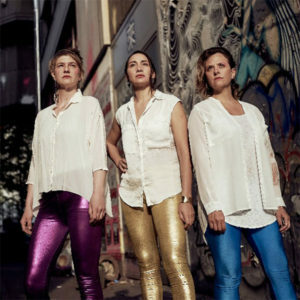 Pink Valley is a three-member, Chilean-German performance collective that takes on the encounters, boundaries and coincidences of life and thus illuminates questions on humanity and cultural identity. The group largely works with the means of postdramatic theater and builds on scenically staged and biographical elements, works site-specific and interactively with the audience and draws its aesthetics from the interdisciplinary. The collective is made up of three female artists with diverse studies background, such as acting, language, art history, theatrical pedagogy, some of them being masters and other bachelors. Each of them has also developed their artistic skills through dance-theatre, improvisation, dance, voice, direction, dramaturgy and yoga workshops, as well as in professional practices with important groups such as Ramba Zamba, Gob Squad and Rimini Protokol. Invitation to an artistic residency in Houseclub, an educational program from HAU Hebbel am Uffer Berlin, 2018. “Zivilisierte Länder” (Performance) in Holzmarkt Berlin, 2017. Selected in the festival Performing Arts Berlin 2018. “Walkin in the trace of the future” (Live performance/intervention). “Raue Strömung” (performance), Eigenheim gallery Berlin, 2017. First and Second studies in OneShot-Residency. Institut für Mikrokosmische Raumforschung, Berlin 2013. Premier in 100° Berlin Festival 2014, Sophiensaele. 5° Afro-Brasilianisches Kultur Festival, Theaterhaus Mitte Berlin, 2014.